On behalf of Victoria’s leadership team—welcome. To those of you who are here for the first time—congratulations on your excellent enrolment choice! You and the 22,000 other students who study here will enjoy a wonderful period in your lives and the education you receive here will stand you in good stead for your future careers and your roles in the community. As those of you who are returning to Victoria this week know, starting at University can be a challenge, whether you’ve come here straight from secondary school or you are back studying after taking a break. It’s a time of massive adjustment and change. One of things we’ve done recently is sign up to an international charter making Victoria a health-promoting university. This means understanding that for you to succeed, you need to be in a positive and supportive environment. It means the health and wellbeing of staff and students is integral to everything we do. So if you need help, please ask. There is lots of support available, such as Student Learning, Mauri Ora (Student Counselling and Health), whānau support for Māori and Pasifika students and Student Finance for your budgeting needs. If you’re struggling or you feel in need of some advice, just ask. Wellington is a fantastic city in which to be a student—safe, vibrant and welcoming—and the student experience at Victoria is second to none. We want you to succeed in your studies and to make the most of your time here at Victoria. 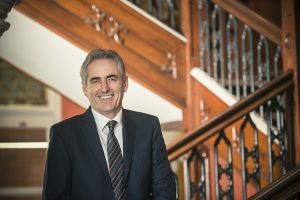 Professor Grant Guilford has been Victoria’s Vice-Chancellor since 2014. You can follow him on Twitter: @GrantGuilford.